Vibrations, such as those of a bridge, a guitar string or a tuning fork, behave like waves, swinging back and forth continuously. Yet, quantum mechanics predicts that this motion in fact consists of tiny discrete packages of energy, called phonons. A team of researchers at the TU Delft and the University of Vienna now demonstrate a new level of quantum control over these vibrations using laser pulses. They create individual phonon excitations and confirm their fundamental particle aspect, adapting a well-known test from quantum optics. They report on their results in the online edition of Science. Beyond the fundamental aspects, the micromechanical beams are very promising candidates for building blocks for integrated quantum information processing with phonons. For the fabrication of the devices, the same technology is used as for integrated silicon photonics. 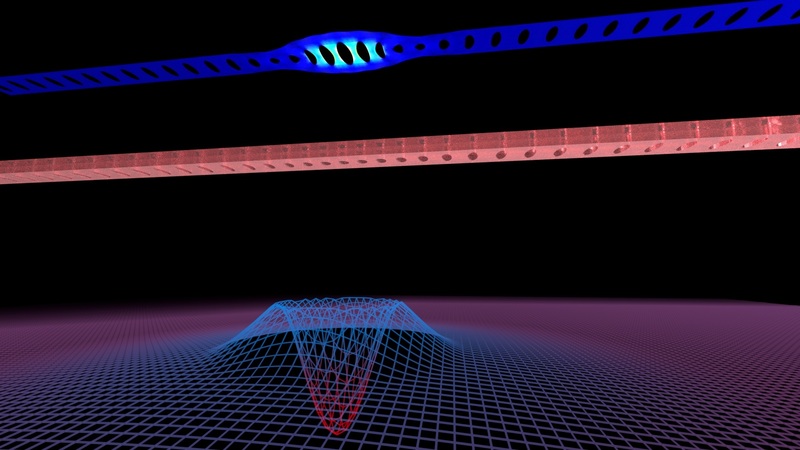 The measurements are already performed with lasers at telecom wavelengths, so quantum information can easily be transferred over large distances. In addition, the small feature size of such phononic circuits allows for high integration and complete engineerability of its properties. These qualities makes them the perfect building blocks for a future global quantum network, featuring superconducting microwave qubits and telecom laser light for the information transfer.